AtlanticCouncil via youtubeFormer Air Force General and Supreme Commander of Allied Forces for NATO, Philip Breedlove, as a civilian, speaks at the Atlantic Council in Washington DC on Wednesday, June 8. General and former Supreme Allied Commander of NATO, Philip Breedlove, spoke about the mounting tensions between Russia and the West as a NATO summit draws near. At July’s Warsaw summit, NATO leaders will convene to discuss the future of the alliance, the possibility of expansion, and overall strategy. 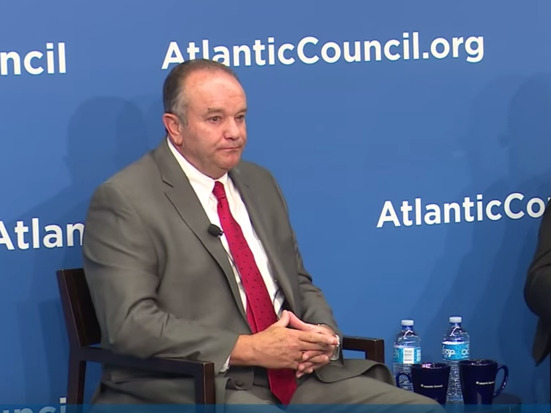 Taking questions from the crowd, Breedlove, who entered military service nearly four decades ago during the Cold War, and spent 4 years as the commander of NATO, explained the successes of the alliance since the last major summit in Wales. “Mr. Putin may actually be a bit surprised at how well NATO has moved forward with the changes that were started in Wales,” Breedlove said. “The progress is measurable and demonstrative in the way that we have exercised and the way that the alliance actually came together very quickly to do things many thought they would never do in building the VJTF (Very High Readiness Joint Task Force),” Breedlove continued. Russian Defence MinistryA Russian bomber drops unguided munitions over Syria. 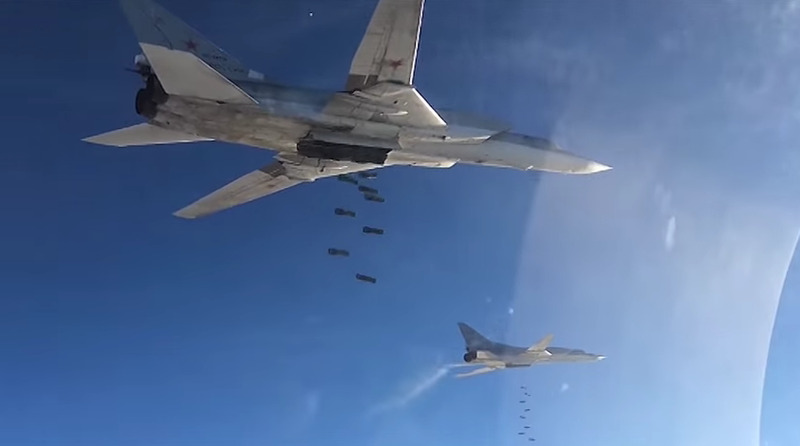 But tensions between NATO and Russia are reaching alarming levels. Despite NATO’s unity, an increasingly belligerent Russia has threatened military action against Sweden and Finland should they join NATO, and the US after one of their ships made a routine patrol in the Black Sea. Meanwhile, the US has positioned not one, but two aircraft carriers in the Mediterranean in advance of the Warsaw summit. 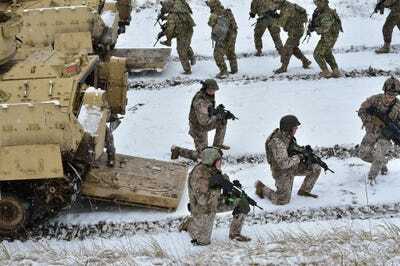 Additionally, RAND Corp through wargamming and analysis estimates that Russia’s conventional forces could seize Baltic capitals like Tallinn and Riga in as little as 36 hours. Though Breedlove acknowledged the veracity of the models used by RAND Corp, he questioned their conclusion. Speaking first about NATO’s success in deterring Russian aggression or advances, Breedlove contested the notion that NATO could not defend it’s most exposed members on the Eastern flank. NATONATO military training at Ādaži Military Base in Latvia. 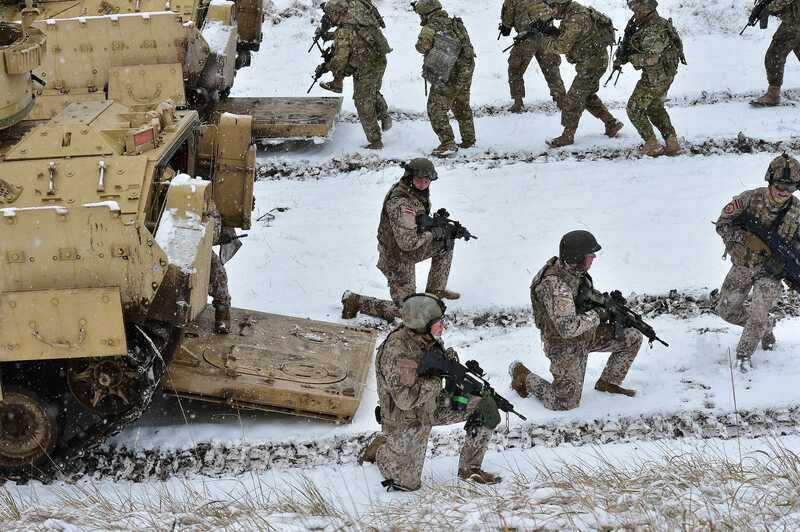 “We can defend if we get early, decisive movements from our nations and our NATO leadership. If we get in front of a problem, which requires good, fused intelligence, indications and warnings, and the courage to make decisions based on those warnings, I believe we can defend,” said Breedlove. At this point, a question steered the conversation towards Russia’s military doctrine. “The Russians speak about, write about, and train to use tactical nukes as a logical and understood extension of conventional war,” said Breedlove. But building a war plan for NATO that projects strength, unity, and determination, yet also includes “off ramps” and “opportunities for deescalation” of conflicts is an “art, not a science,” Breedlove conceded. Instead, Breedlove firmly put forward that the US must open lines of communications with the Russians who have “talked themselves into a frenzy” regarding war and the use of nuclear weapons, as an Atlantic Council member put it. Towards the end of the conference, Breedlove reaffirmed Obama’s statement at the 2014 Wales summit that “we will defend every inch of NATO territory,” stating that the commitment to honouring Article 5, which essentially treats an attack on one NATO member as an attack on all NATO members is as strong as ever. “Russia does understand power, strength and unity,” said Breedlove, offering some hope for reconciliation for the two forces that find themselves in the most heated conflict since the Cold War.